Woah, Gandalf, Hobbits and the rest of the crew of The Lord of the Ring in hairy cloud with colors! Cool, but what is that? What does it mean? What do I mean with relation? Well, that is one of the best question to be answered. Some projects define it as appearing in the same scene for theater plays (like the DLINA project from Göttingen) or in the same paragraph for novels (like my colleagues from the Kallimachos project in Würzburg). 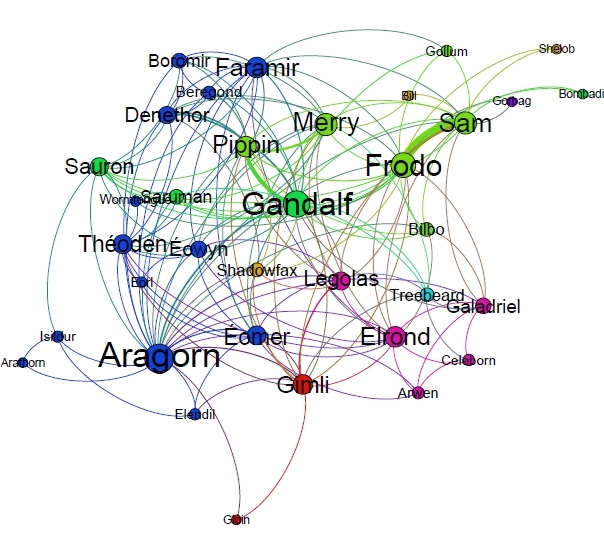 So, using the same idea, I wondered how the network of The Lord of the Rings would look like. Would Frodo be close to Bilbo? Arwen to Aragorn? Legolas to Gimli? 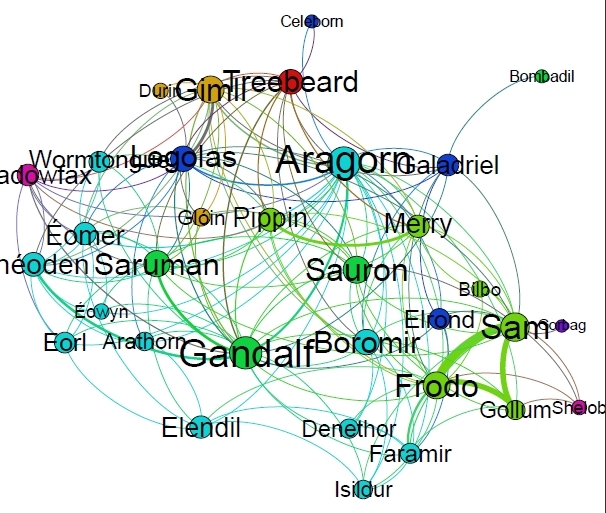 Gandalf, Saruman and Sauron appear quite in the center of the network. We have to remember that to create a relation there is no need that the two characters are together in the same room, just that their names appear in the same paragraph. That explains why Sauron, who never really encounter any of the characters, is so central. In the group of the men you can even see differentiated the two nations: Rohan is on the top, while Gondor is on the right. Even Merry and Pippin are closer to the group of the country were they served. Is also interesting that the four people from Gondor, who are dead in the majority of the books (Arathorn, Boromir, Isildur and Elendil) are close to each other. A lot of literary information! Incredible, isn’t? But of course, some of the relations that we are seeing might be effects of mixing the three books (as Nils Reiter pointed out). What happen if we create networks for each book? First we have to say that the colors of each visualization are random, this is why in each visualization the colors for the races are different. In general I have to create a more homogeneous way of dealing with visualizations. As we can see, in some of the books the groups that we saw in the total network don’t exist any more. For example the hobbits and elves in the second book, or the elves in the first book (divided in the Rivendel and Lorien group). Some relation also changed a lot, like Aragorn and Gollum in the first book (we tend to forget it because it doesn’t appear in the film, but actually Aragorn and Gollum spent a lot of time together!) or Aragon, Gimli and Legolas. 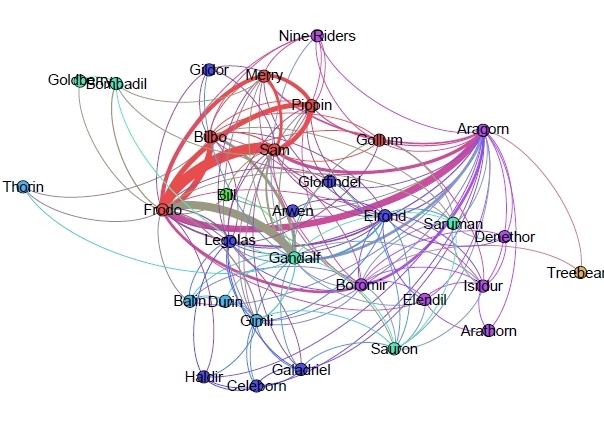 One effect that I haven’t been able to interpret is the distance between Aragorn and Frodo: even if they have a very strong relation (like in the first book), they tend to appear in the opposite side of the network. They kind of create their own relations that they don’t share, even if between them are a big connections. Something like we are close but we don’t mix the people around us. Does anyone have a better explanation? Anyway it was very exciting preparing, visualizing and interpreting the results. 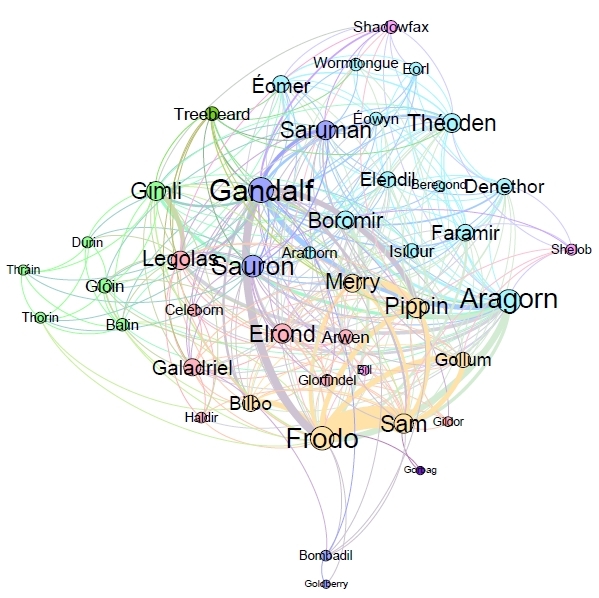 I would like to post some more info about differences between networks deleting more or less edges, gender of the protagonists, places, races, comparing to other Tolkien’s Texts… And if you find it interesting, let me know your thoughts, ideas, comments or corrections! Hey, I’m doing a project for a math class and would like to use a LOTR graph. Is there any way you could send me the adjacency matrix for the top one? It would help immensely. Thank you so much for the help, I really enjoy the site. I didn’t create for this project the adjacency matrix, I create the edges directly from the paragraphs.